Diese schöne Lodge ist der perfekte Ort, um die Ruhe von Dartmoor und der umliegenden Küste von Devon zu genießen. Hinweise zur Unterkunft: Bettwäsche auf Anfrage erhältlich. Doppel £ 20, Einzel £ 5 pro Stück. Maximal zwei Hunde erlaubt in der Trout River Lodge für £ 25 pro Woche. Eine rückzahlbare Kaution von £ 50 ist mit dem Restbetrag fällig und wird nach Ihrem Urlaub zurückerstattet. Draußen: Von den Wohn- / Essbereichen führt ein geräumiger Balkon mit Tisch und Stühlen, ideal für Mahlzeiten im Freien. Von hier aus können Sie die friedliche Umgebung genießen, dem Fluss zuhören und die Bussarde über sich hinwegfliegen sehen. Vogelfütterer sind für Sie da, um die zahlreichen Vogelarten anzuziehen und Sie können Damwild beobachten, wenn sie auf die Wiese kommen, um zu grasen und vom Fluss zu trinken oder den Fischotter zu sehen, während er sein Fischabendessen fängt. NB: Der Pool vor Ort ist jetzt dauerhaft geschlossen. Es gibt auch einen Kinderspielplatz für alle. Saubere Unterkunft in sehr netter und ruhiger Umgebung, wenn man gewisse Abgeschiedenheit mag... Das Zimmer im OG wird bei viel Sonne leider sehr warm, was aber wahrscheinlich nicht in jedem Sommer das Problem ist... Insgesamt sehr empfehlenswerte Unterkunft. Clean accommodation in very nice and quiet surroundings, if you like some seclusion... The room on the floor is very warm with lots of sun, which is probably not the problem every summer... Overall very recommendable accommodation. Thank you for your review. So pleased you enjoyed our lodge and the very peaceful location. Its a great place from which to explore Dartmoor. The lodge is in a very sunny situation and the balcony gets sun most of the day which is fantastic especially for eating outside in the evening. As you mention, being too hot is not normally a problem! Your visit was during our heatwave and you must have seen Dartmoor at its very best. Fantastic well equipped property in a unique setting. We arrived at the property, parked the car for the week, lovely walks on the door step especially the track to Fingle bridge where we enjoyed a Devonshire cream tea, on the way back several deer ran straight out in front of us, things do not get much better than that, had a great relaxing week & hope to return next year. So pleased you loved our lodge and enjoyed your holiday. Sounds like you had a great time and seeing the deer is always a bonus. Hope to see you next year. Fantastic location, spacious feel to the lodge and appreciated having the wifi. Very peaceful location and the kids loved the freedom ofbeing able to ride their bikes around. It was nice being away from the mobile phone reception but it was great having the wifi access. This made it possbile to book activities online and do our research for days out. It was a shame that the pool was not up and running but the river was the next best thing! Really pleased to hear that you enjoyed our lodge and the wonderful setting away from it all. It really is the ideal place to escape the hustle and bustle of daily life and yet still be able to explore Dartmoor and Devon really easily. Nice for the kids, too, to be able to enjoy nature and old fashioned pursuits like paddling in the river. Hope we see you again in the future. From the precise directions to find the log cabin ,through the whole of our visit we were very pleased . 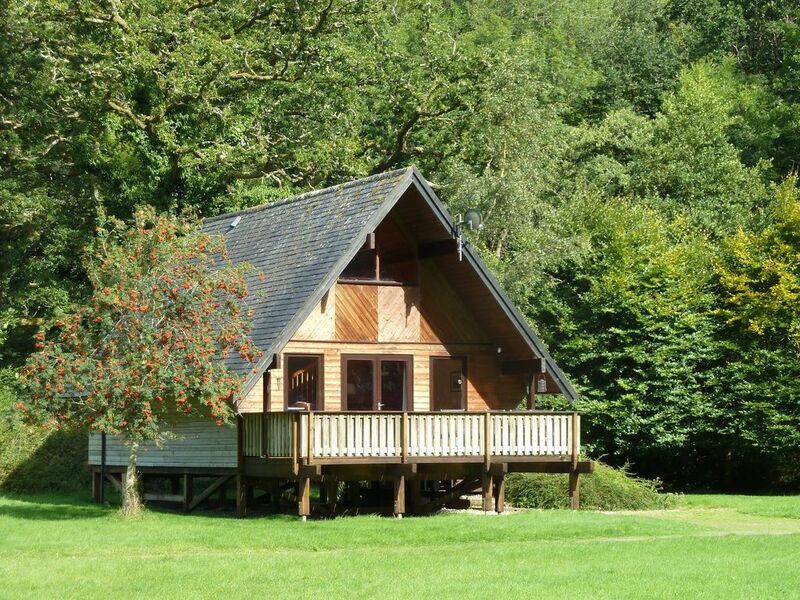 The cabin was warm and very clean on arrival .It was extremely well equipped with everything required to make our stay relaxed and enjoyable.The setting was idyllic with the opportunity to walk and enjoy the wild life .It was an ideal base for exploring Dartmoor . Thank you for your positive review of our lodge Katrina and we are so pleased that you all enjoyed the lodge and had a wonderful holiday. Do hope you will be able to visit again in the future. We (family of 5 - kids 11 and 13 + a cockerpoo) have just returned from a weeks break at Trout River Lodge. I must say that we had a fantastic relaxing break. The Lodge is very clean and has all the creature comforts needed for your holiday. The scenery is outstanding and you really feel that you are in the heart of the Dartmoor wilderness. Fantastic walks on your doorstep, we did the Fingle Bridge walk (1 hour each way) with a 2 hour stop at the pub (which has great food and is picture card perfect) a number of times. The kids were gutted at first that there was no mobile or Internet but had completely forgoten at the end of the week after embracing the nature and wildlife. Wife and myself commented on how it gave us memories of how holidays were when we were kids. Flussmündungen wie Salcombe, Dartmouth, Teignmouth - ideal für Bootsfahrten, Sandstrände wie Blackpool Sands mit seinem hervorragenden Café, Bantham - ein Surfparadies und Bigbury, wo Sie über den Sand nach Burgh Island laufen können. Es gibt auch ruhige Buchten und Felsenpools und für Wanderer gibt es den endlosen Küstenweg mit herrlichem Blick auf das Meer bei jedem Schritt. Obwohl es in dieser ruhigen Ecke von Dartmoor versteckt ist, ist der Zugang sehr einfach. Folgen Sie der M5 und dann der A30, die eine Kreuzung bei Cheriton Bishop hat, nur 10 Minuten von der Lodge entfernt. Der Hafen von Plymouth ist etwa eine Stunde entfernt und der Flughafen von Exeter etwa eine halbe Stunde mit dem Auto entfernt. Die Lodge befindet sich im Nationalpark Dartmoor. Moretonhampstead mit zahlreichen Geschäften, Banken usw. ist 10 Autominuten entfernt. Dunsford und Fingle Bridge, beide mit ausgezeichneten Pubs, sind entweder 10 Minuten mit dem Auto oder etwa eine Stunde zu Fuß entlang des Flusses. Es gibt einen guten Dorfladen in Cheriton Bishop 10 Minuten mit dem Auto. Castle Drogo, eine Unterkunft des National Trust, ist 15 Minuten mit dem Auto oder 1,5 Stunden zu Fuß von der Lodge entfernt. Chagford und Bovey Tracey sind 20 Minuten mit dem Auto entfernt. Once booking has been accepted please email me with guests names and address. Then five weeks before your holiday I will send you a pack containing details about the lodge, map, directions, local information and leaflets. For those taking a dog to Trout River Lodge a £50 refundable dog deposit is required, payable directly to me by cheque when you pay the final balance. I will then destroy this cheque after your holiday when all confirmed well by our cleaner. Changeover Day: Bookings are from Saturday to Saturday. The lodges are available from 3.00 pm on arrival day and departure is by 10.00 am on day of departure. Occasionally off season short breaks are available and dates may be more flexible.